Yoga + Your Dog = Doga! Come join us for this unique event where you can do yoga with your dog! Aimee Hyatt of DogaFit will be leading our FREE workshop in Culver City where you do downward dog WITH your dog! 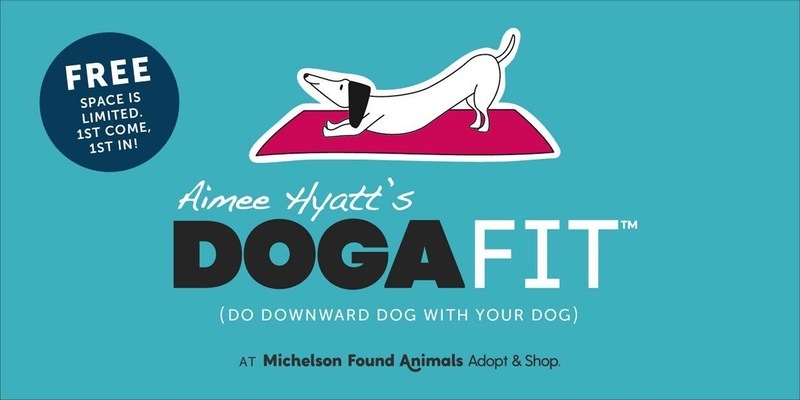 Michelson Found Animals Adopt & Shop is happy to hold it's first in-store Doga event. It's a fun group class that allows you time to bond with your dog while doing yoga and learning massage techniques your dog will love. You and your well-mannered pet are invited to participate in a friendly & relaxing environment for this 2-hour event. Dogs must be fully vaccinated and on a leash once the pet is settled in and comfortable in its new environment. Tickets are first come first serve. *Guests will need to bring their own yoga mat and towel. Doga creates a bonding experience stronger than simply going for a walk or sitting in the park with your dog. Doga is a partner activity which gives the yogi and the dogi the same benefits of yoga. Through the gentle acts of meditation, breathing techniques, massage, and careful stretching, the human practitioner seeks to achieve a greater harmony with their dogs. When we are relaxed, our dogs relax too; they feed off our emotions. Our dogs are like our own little biofeedback machines. They know when we are calm or excited. Like humans, every dog has a different level of fitness of fitness. Go slow.. be gentle.. be aware, and enjoy. Discovering union in a fun and playful is what makes Aimee’s doga classes unique. She creates a very safe environment where everyone can relax and let go; giving both the yogi and the dogi an opportunity to bond and connect in a new way.